I made this baklava mostly for my daughter. Honey is her favorite food and she would eat it out of the jar if I let her. Most baklava recipes call for a ton of sugar, but I used some dates and honey for sweetness instead of refined sugar. You can always substitute agave for the honey if you don’t use it. The baklava was sweet and nutty with a nice crispy top from the phyllo dough. Put the nuts, cinnamon and salt in a large mixing bowl. Strain the dates and reserve 1 cup of the soaking water for the syrup. Puree the dates in the food processor and add to the nuts. Mix the dates in thoroughly, you will need to use your fingers. sett aside. Put all of the syrup ingredients into a medium sized sauce pan. Bring to a boil over medium high heat. Let it boil for 10 minutes and then remove it from the heat to cool. Preheat the oven to 350. Unwrap the phyllo dough and cover it with a damp cloth (keep it covered as much as possible, it will dry out really fast). Spread some melted butter in the bottom of a 9X13 baking dish. Lay in one piece of phyllo and brush it lightly with melted butter (make sure to keep the rest f the phyllo covered). Repeat with seven more sheets of phyllo. Sprinkle on about a 1/3 of the nut filling, spreading it evenly over the dough. Cover the filling with 2 sheets of phyllo brushed with butter. Put on half of the remaining filling and cover with two more sheets of buttered phyllo. Add the remaining filling and then cover with 8-10 sheets of phyllo buttering each one. Brush butter on the top sheet making sure it is completely covered. Before baking cut the baklava into four long strips lengthwise. Then make about 8 diagonal cuts to make diamond shaped pieces. Bake the baklava for 40-45 minutes until the top is a nice golden brown. While the baklava is baking make the syrup. When the baklava is finished baking set the pan on a rack to cool. Let it cool for about 20 minutes then pour on the syrup. Make sure you get it down into all the cuts. 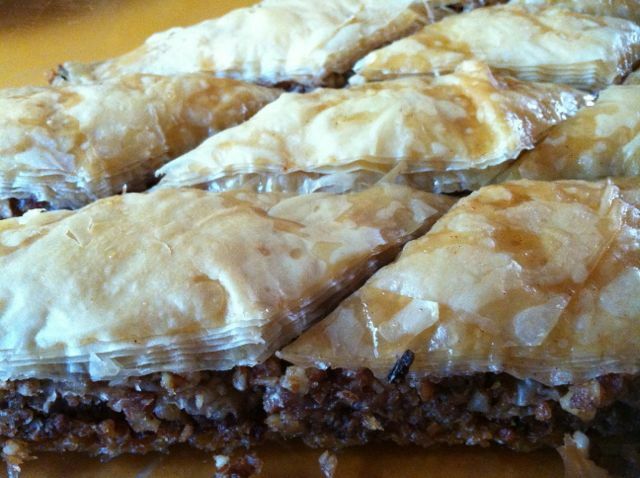 Let the baklava cool completely, at least a couple of hours, before serving.